Maize is an upcoming adventure game from Finish Line Games that begins when government scientists misinterpret a memo and create sentient corn, a vegetable I am never eating again thanks to the first teaser trailer. I’m all for the cartoonish personification of corn as seen in Plants Vs. Zombies, but Maize isn’t going for cartoonish. 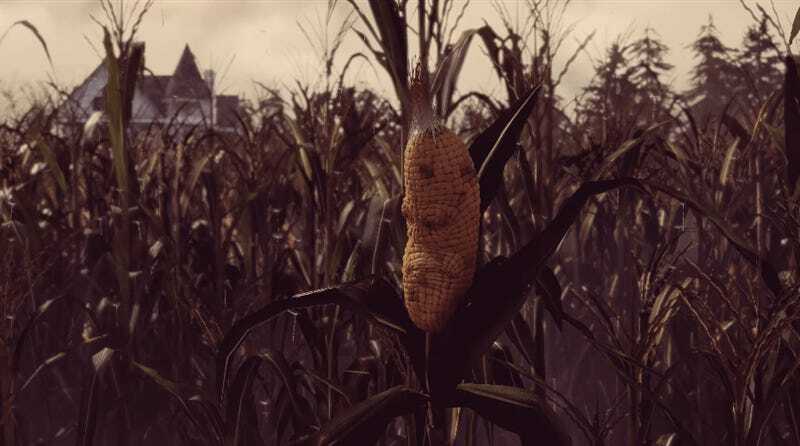 Absurdist, sure, but that’s a real ear of corn with a face. While I won’t be eating the game any time soon, the warm, muted tones in the first images from the first-person adventure have me looking forward to playing Maize on PC this fall. They contrast nicely with the colder hues from this interior shot. It’s Teddy Ruxpin! Even better, it’s a Russian knockoff of Teddy Ruxpin. Channeling elements of Monty Python and the funnier episodes of the X-Files, Maize is an absurdist, first-person adventure with a cornucopia of highbrow puzzles to solve, talking oddities to meet, and mysteries to be harvested, coming later this fall to PC. Explore the desolate farm for clues to the past, venture deeper into the underground research facility, and make a few…colorful friends along the way, including a grumpy Russian knock-off of the most technologically advanced toy ever created: Teddy Ruxpin. That’s the official description. Sounds like Maize is right up my alley. So while I am losing corn, I’m gaining what sounds like a very strange game in the process. Seems like a fair trade to me. Stay tuned to MaizetheGame.com for more on this odd thing.